Met up with Kevin Sumner today to knock on doors on the hottest day of the year so far. Not ideal canvassing conditions but the feedback we had was very good, and it looks like our vote is holding up, ahead of Thursday. The boards and diamonds are starting to appear around town, and we have finally seen signs of Tory activity, in the shape of a leaflet through the doors. One thing is very noticeable. 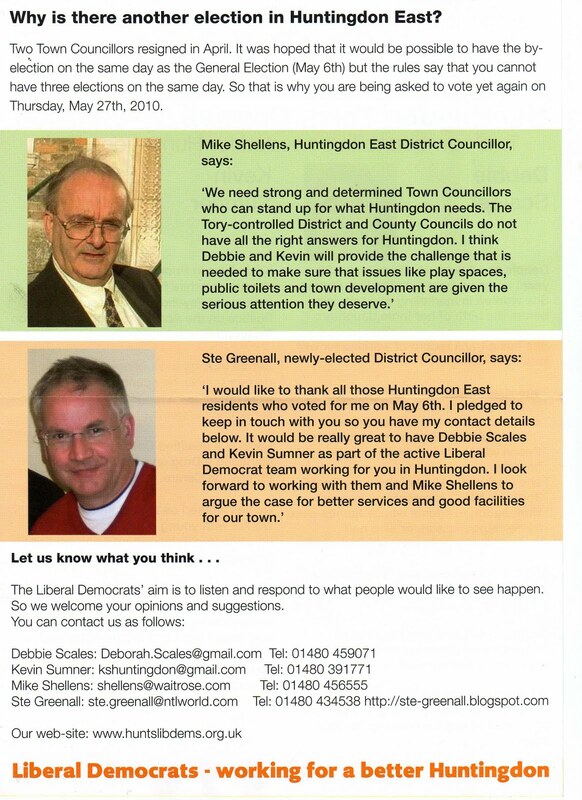 Despite the leaflets saying "local conservatives", one of the chaps, Mr Bish, whilst living in Huntingdon, doesn't live in Huntingdon East. The other, Mr Hensley, lives a little further afield.....errrr....WARBOYS. I feel certain that our two candidates, Debbie and Kevin, have everything it takes to be successful, and we are all just hoping that people aren't too "election-fatigued", and do vote on Thursday. Ben begins his GCSE's in earnest this week, so it could be a little tense in the Greenall household, but we feel sure he'll be giving it his best shot. Two barbeques this weekend - hot enough, or what? Like first day at big school! Along with my new Lib Dem buddy, Steve van der Kerkhove, from St Neots, Wednesday 19th May will go down as our first District Council meeting. As Steve said, it was like first day at big school. Once again, I took pictures where you wouldn't normally get to see them, though since I have now realised that many main Council meetings are open to the public, it is open season on 'reporting' what goes on. The first picture shows Steve and I after we took our seats. The second, moments later, came when Steve slopped his coffee over the table, but somehow managed to get some inside his phone. 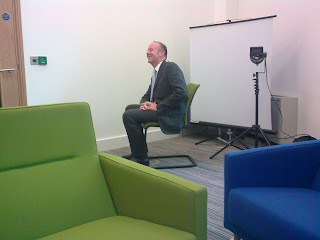 The picture where Steve is sitting on the green chair was when all the new councillors, and some of those who were re-elected, had their pictures taken for the passes we will get issued with, as well as the website. The meeting was the AGM of the District Council and I'd been told to expect it wouldn't last much mote than 90 minutes, as it was mainly to swear in new leaders and ratify the committees we will all sit on. Proceedings began with a prayer from Father Paul Maddison, from St Ives. Wasn't expecting that. Next on the agenda - Chairman's Announcements - which gave outgoing Chairman John Davies a chance to thank various people, make a presentation to a chap who has been on the Council for yonks - can't remember his name but I think he's from Warboys. The new Chairman was sworn in, and it was Jeff Dutton, who was elected unopposed. Which was just as well for Jeff because he had an acceptance speech already written! Fact is that even if the Lib Dems had put someone forward, the Tory would win because there are more of their councillors than the rest. 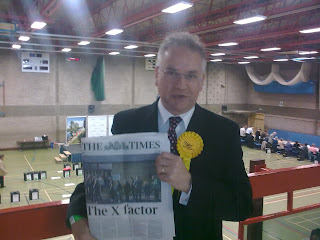 When it came to electing a Vice Chairman though, Peter Downes, Lib Dem leader on the District Council, proposed Mike Baker, who is a nice chap; taught at Hinchingbrooke and still does DofE courses up there. Mike Shellens seconded him. 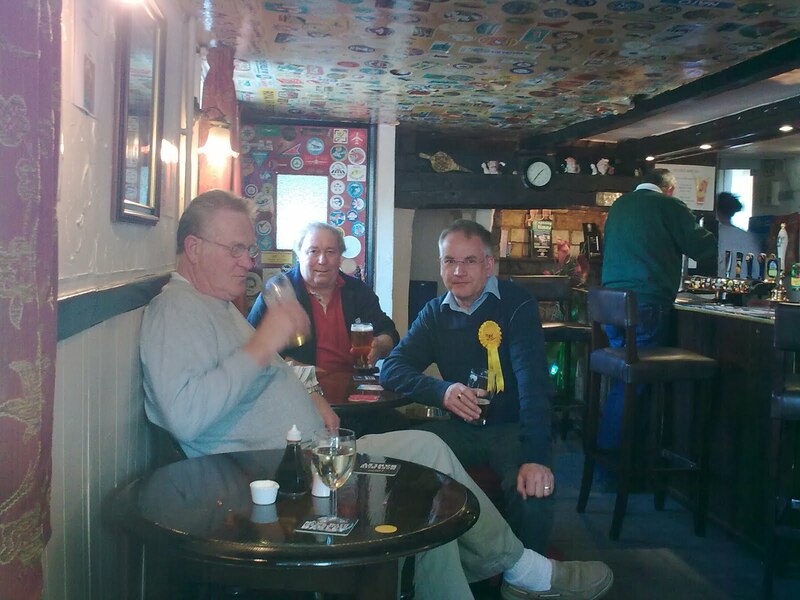 But when it came to the vote, even though all the Lib Dems PLUS the two UKIP members voted for Mike, he was defeated by a lady called Barbara Boddington, for the Tories. Now clearly she had been expecting to win. Remember I had said we had all gone for photos, BEFORE the AGM started? Well, Barbara had been photographed WEARING THE VICE CHAIR'S CHAIN!!! So she obviously knew she was a shoe in. 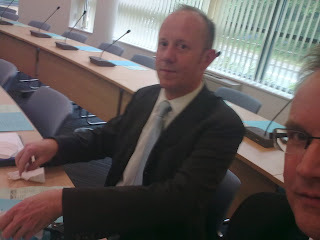 Ian Bates, who is the current Leader of the Council, was re-elected to do it again. I was elected onto the "Overview and Scrutiny Panel - Economic Well-Being" committee, which basically is a sub-group that challenges the financial plans. I shall look forward to that. 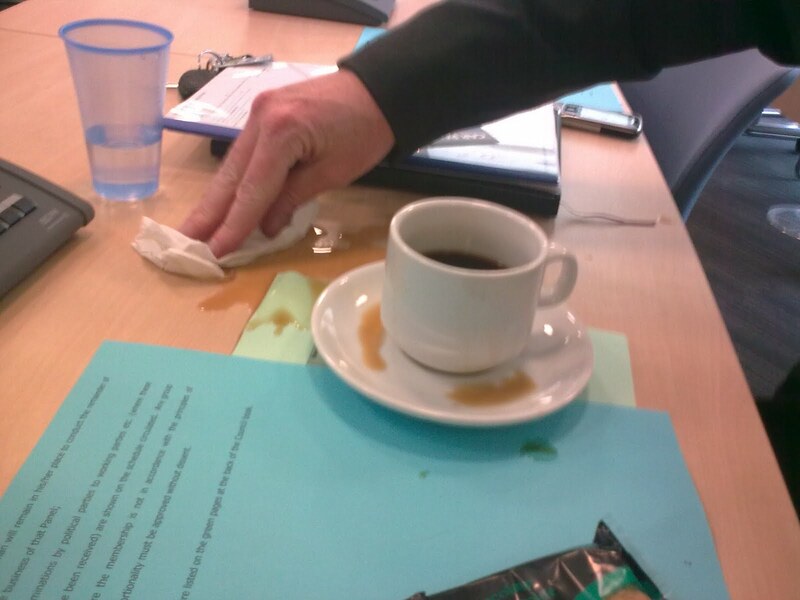 So that was that.....apart from Steve spilling his coffee, no fun and games. The new building is nice, but I can't help thinking it is too big. For a start, the ceilings are really high, If each floor had been a few feet lower, think of the materials and labour that could have been saved building it. Hmmmmm....that's for another day. 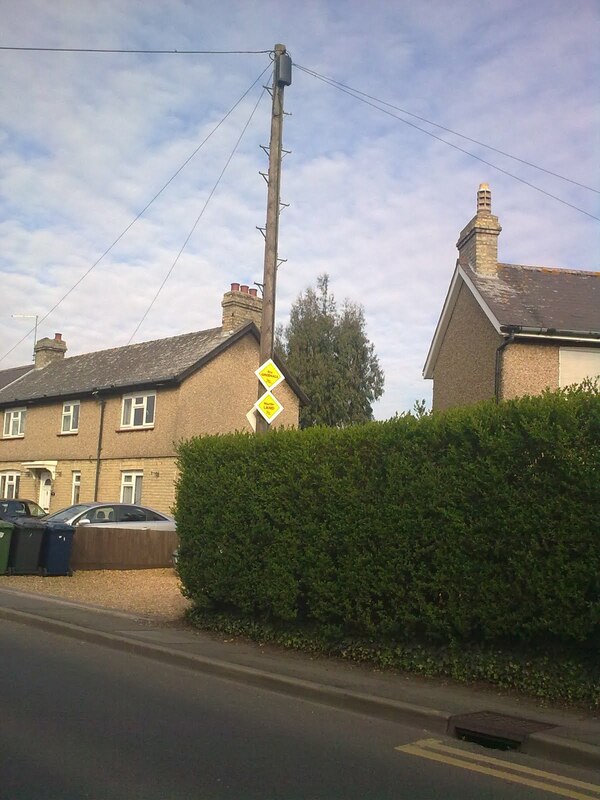 Meanwhile, I am delighted, though I can claim miniscule credit, to find out that two families in Barn Close have won the right for the County Council to look again at re-siting a bus stop right behind their houses. Just shows that when someone, as Stephanie has done, writes an effective letter and makes sure it gets to the best person, change can happen. All I did was add grease to the wheels here and there. I hope the bus-stop gets moved soon. I will be attending my first District Council meeting this coming wednesday, when I also expect that the Committee I shall be sitting on will be ratified. Meanwhile, a few iussues are raising their heads, which I am getting involved in. The first one, which actually cropped up in the few weeks before the election, is the siting of a bus stop in Salpey Road, which directly overlooks houses in Barn close. This isn's a case of "not inmy back yard", as there is a perfectly good stopping space just 100 yards up the road, and which is offset from the road itself, and adjacent to a footpath. Why this wasn't used in the first place, I shall never know. 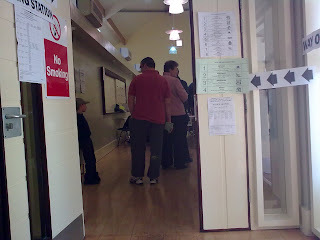 What is more worrying, however, is that I have had sight of an e-mail which suggests residents were consulted. 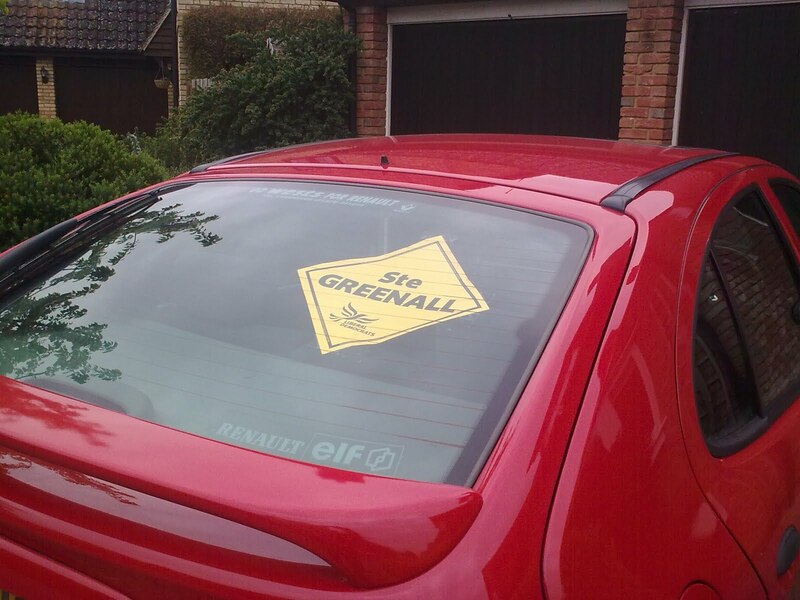 Hardly seems like we have drawn breath since the General Election, and yet we're off to the polls again. 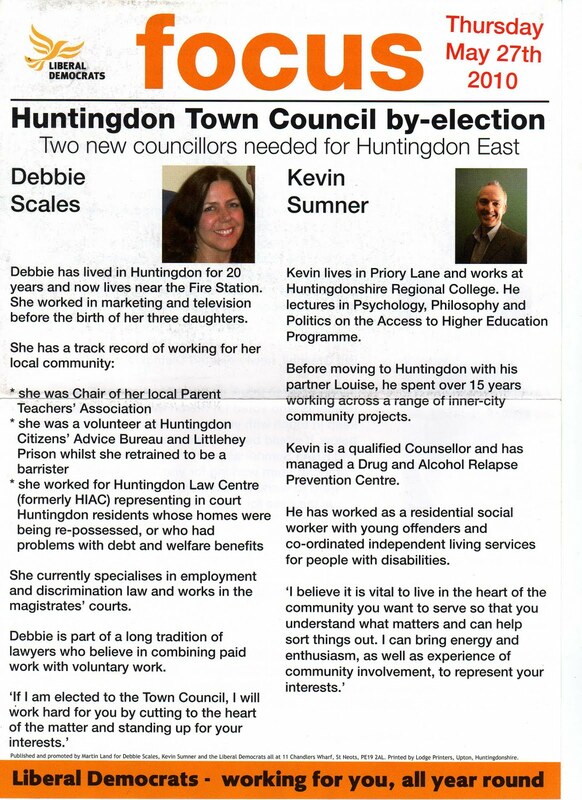 There are two seats up for grabs on Huntingdon Town Council, and we in the Lib Dems have two excellent candidates, in Debbie Scales and Kevin Sumner. Both Debbie and Kevin put in many a worthwhile shift campaigning for me in the District Council elections and Martin Land in the General Election. They are fantastic candidates, and I wholeheartedly commend them to you. 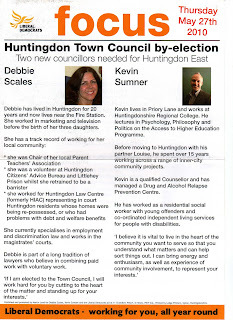 I have scanned our latest leaflet, Focus, which tells you more about Debbie and Kevin's backgrounds. Like myself, Debbie and Kevin live in the ward, and I am delighted to be able to help their campaigns by delivering leaflets. 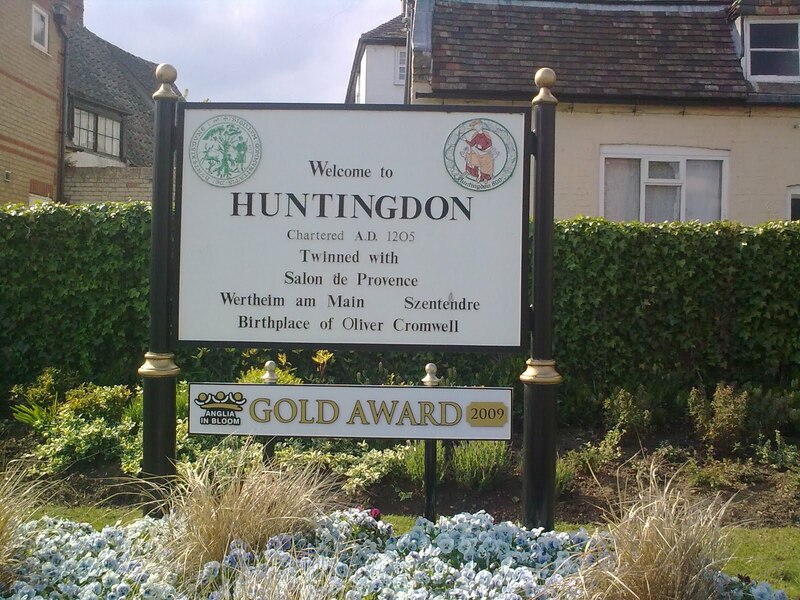 Part of my pledge to the constituents of Huntingdon East was to keep in touch, and to help in this aim, I shall be keeping this blog page as up to date as I can, as well as my Facebook page, which you are very welcome to join. 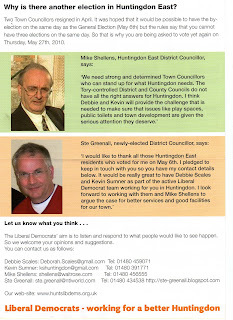 The latest leaflet contains my e-mail address and phone number, and the same applies to Debbie and Kevin. The Liberal Democrats in coalition with the Conservatives. When I went to sign a declaration form last night, in order that I can be a fully fledged District Councillor, I discovered, in conversation with David Monks, the CEO of Huntingdonshire District Council, that he is a rugby league fan, and if truth be told, supports Wigan. I heard an ice-cream van in Biggleswade playing “Liberty Bell” – the theme tune to Monty Python’s Flying Circus. I took Ben to the driving range and was hitting shots with my driver - straight and over 200 yards. David Beckham addresses an audience of FIFA, without notes. 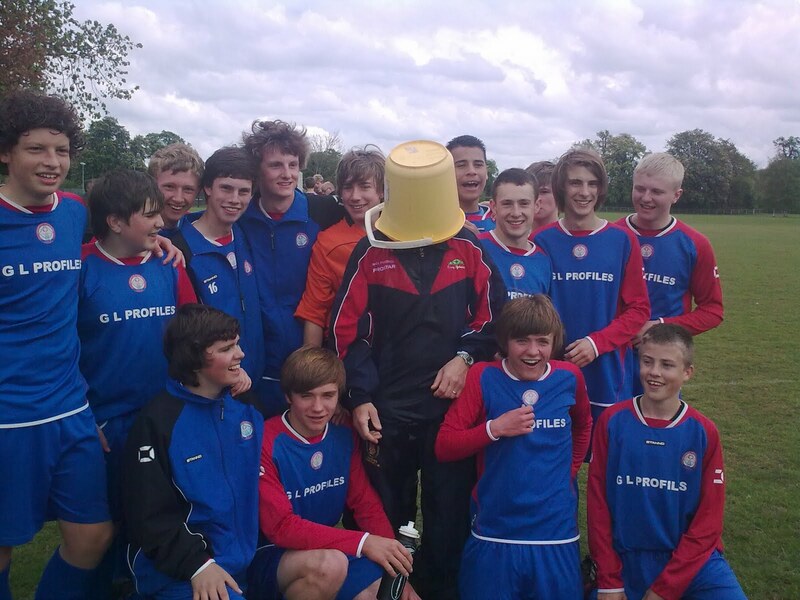 It's been a funny old week, but it began with the Brampton Spartans under 16s ending their season in the only way they knew how - a bucket of cold water over Manager Mick Forsdick's head! Politically, almost a week has gone by, I have had a large box file, a lever arch file, a diary, various letters and invitations, a request to fill out a CRB form, and God knows what else. Loads of stuff. 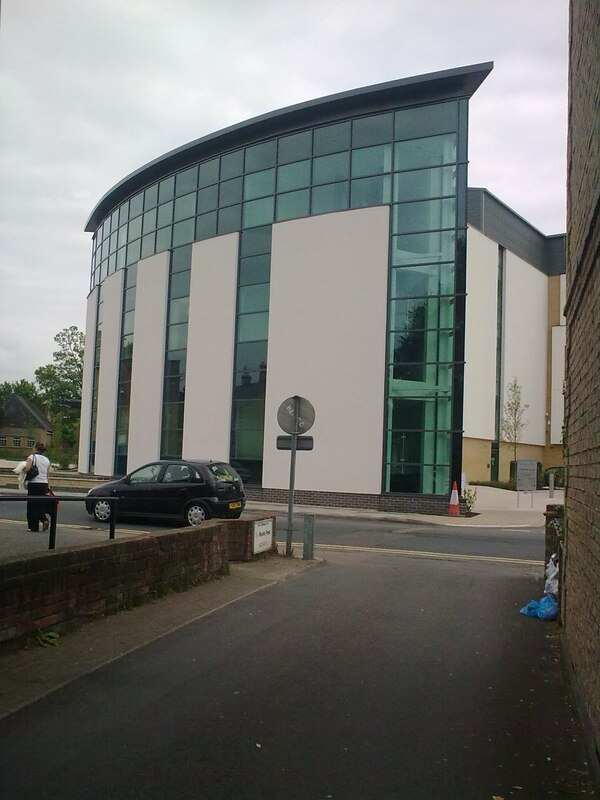 But I am very much looking forward to attending my first council meeting, which will be on 19th May - just a week away. 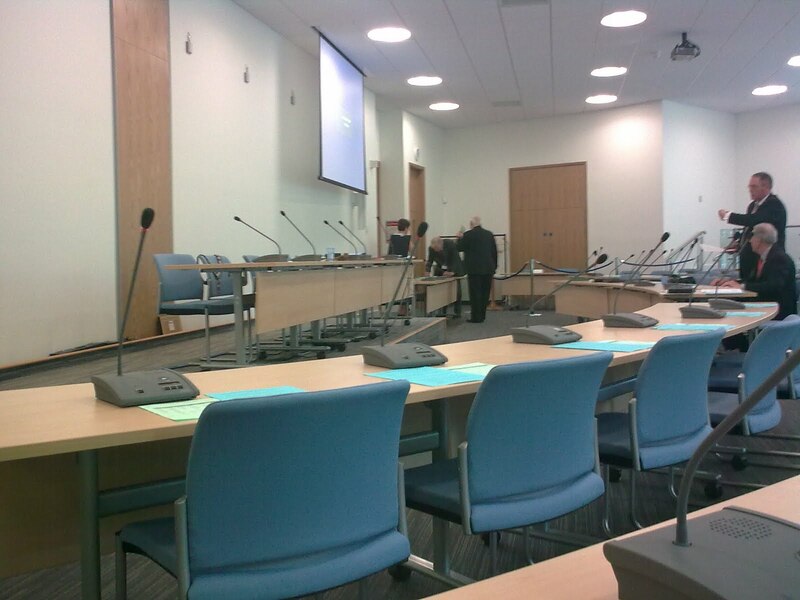 It is the District Council AGM, and I expect a new leader will be elected. I have had the letter of thanks to the constituents that I sent to the Hunts Post published. 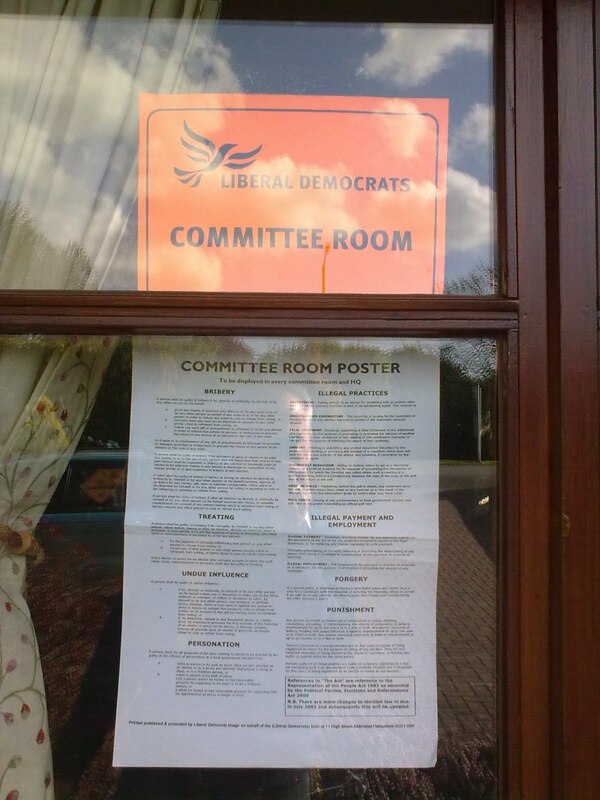 Meanwhile, nationally, the Lib Dems have gone into a full blown 5 year coalition with the Tories. Not what I would have picked from the outset, but the early indications are quite sound, actually. Certainly, the two local MPs, quoted in the Hunts Post, are way off target. 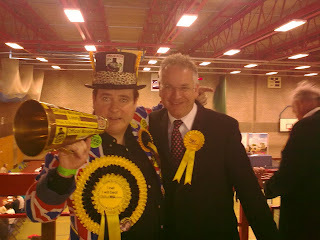 Mr Djanogly predicted a "distinct possibility of another election in the near future". Doh! 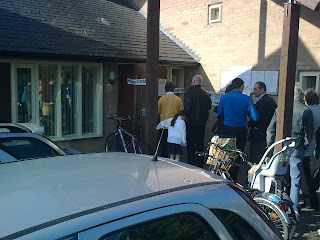 Unless he was meaning the up and coming Huntingdon Town Council elections! No - didn't think so. Shailesh Vara accused the Lib Dems of "putting electoral reform and their own self interest ahead of the good of the British people". He said that On Tuesday (presumably around lunchtime - press deadline for the Hunts Post). Within a few hours, though, the BBC website was saying "Out of the hung parliament delivered by the electorate's verdict, the Lib Dems and Tories have conjured up Britain's first coalition government in 70 years.Lib Dem MPs will sit around the Cabinet table with their fellow Tory government ministers. Individual Tories, expecting high office, will have been sacrificed on the altar of getting a deal done. To arrive at this position, unthinkable during the worst exchanges of the election campaign, stumbling block after stumbling block has just melted away.Compromise has been the order of the day." It is obviously far too soon to know how this will all pan out, but for now, I'm prepared to sit back and watch. However, as far as Hunts East is concerned, the Liberal Democrats won the seat this time around, and I shall work to my utmost to do the best for all 9,000 in the ward. Back to work after the campaign. 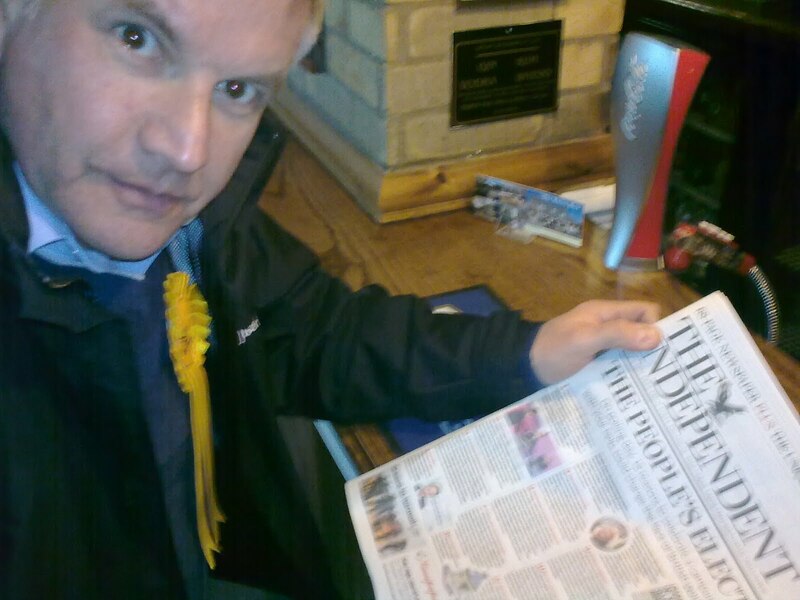 Tiredness has kicked in, the adrenalin has died down, and having got home tonight, for the first Lib Dem group since the election I forgot my agenda! "Well, I looked at your blog. I'm surprised you had time to do it while you were electioneering. The pictures convey the excitement and industry of the campaign. All you are left with now is the work that lies ahead." "Congratulations on being elected as Councillor for the Huntingdon East Ward, your welcome pack is on its way to you." "I have just looked on the Huntingdon District Council website and I see you got elected"
"Many congratulations Councillor Greenall, just seen the election results on the web - well done!" The first one is the bundles of paper that got me elected!!! 2,075 with a cross against my name. 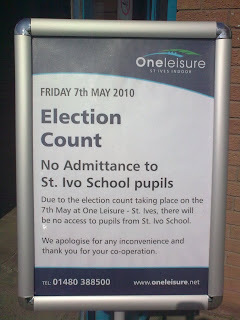 The second one shows the notice as you went into the count. 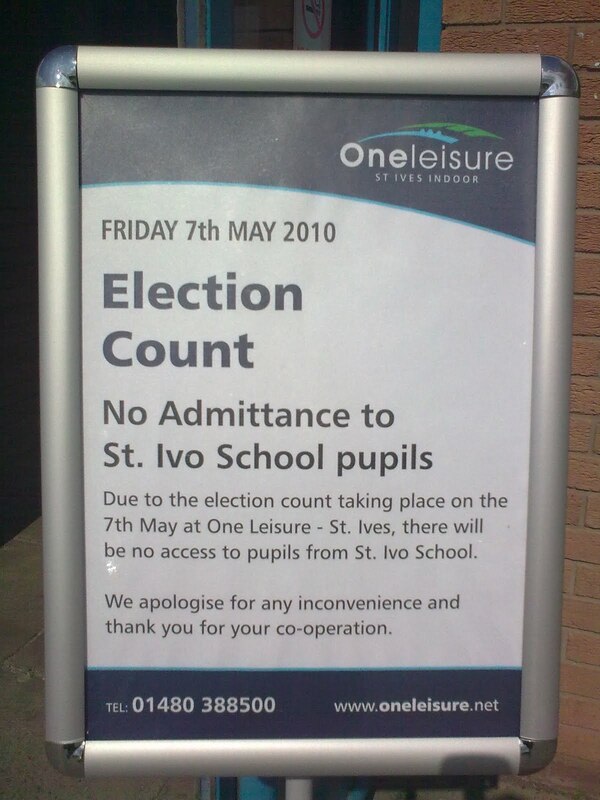 Ignore the bit that says "No Admittance to St Ivo pupils", as I saw some that were, and one has now become a Facebook friend as he wanted the Liberal Democrats to win. 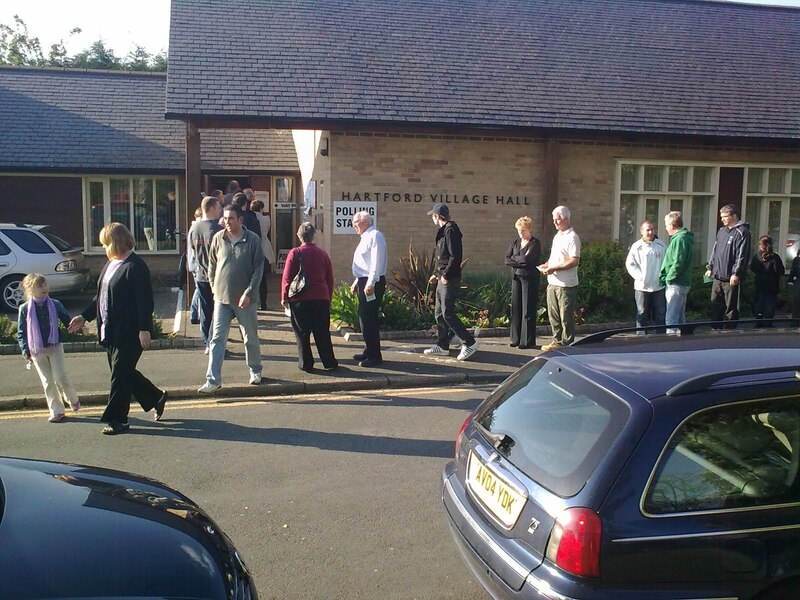 Third one: After spending 10 hours of Election Day in the Polling Station in Hartford Village Hall, I couldn't believe the conversation that took place at 7.15 am the morning after. Ben: "Dad, why is there a picture of the Village Hall in the paper? Me: "Which paper? 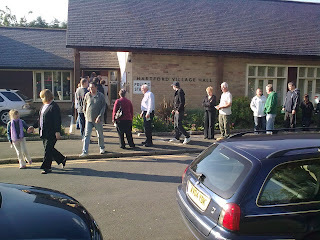 Which Village Hall? Me: "Which paper? Cambridge News?" Ben "Yeah.....you can see the writing"
At which point I jumped out of bed and cycled round for a copy.errrm.......three copies. 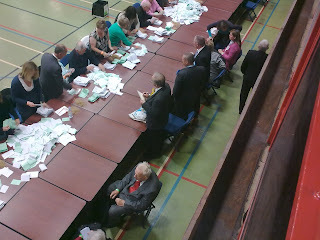 So the third picture is me, with the Times, on the balcony at the Ivo, whilst the count for the MP is taking place below. Next picture shows the counting taking place in the Sports Hall and the final one is me with the Monster Raving Loony, Lord Toby Jug. I am totally wasted....what a long campaign and battle it has been. Good luck, Sid, it's between you and me. See you at the Ivo. Well first of all two questions. Are any other Hunts DC candidates carrying out "telling" work (6 hours so far, 5 more to come) AND updating a blog and Facebook? Brilliant news, and it gives me the impetus to work even harder. I have a few more pictures. 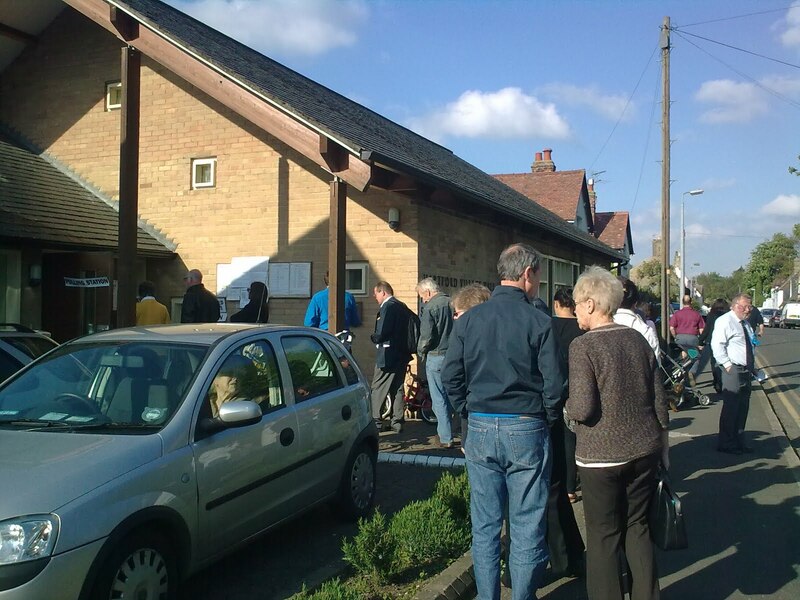 This was the polling station at 3.15; rare to have a queue at this time, but it has been quite busy, and the cinder toffee from the Retro Sweet Shop has been going down a storm. 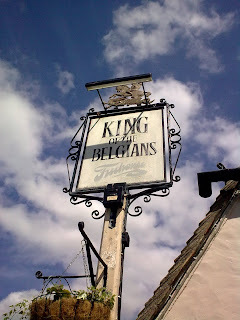 And what better a way to spend a short break from the hustings than a nice pint, on this occasion at the King of the Belgians. Thanks to Damo for the pint and taking the picture. Meanwhile, back at the Committee Rooms, the results from the telling are being compiled into the LibDem election systems. I wonder what it is telling us. 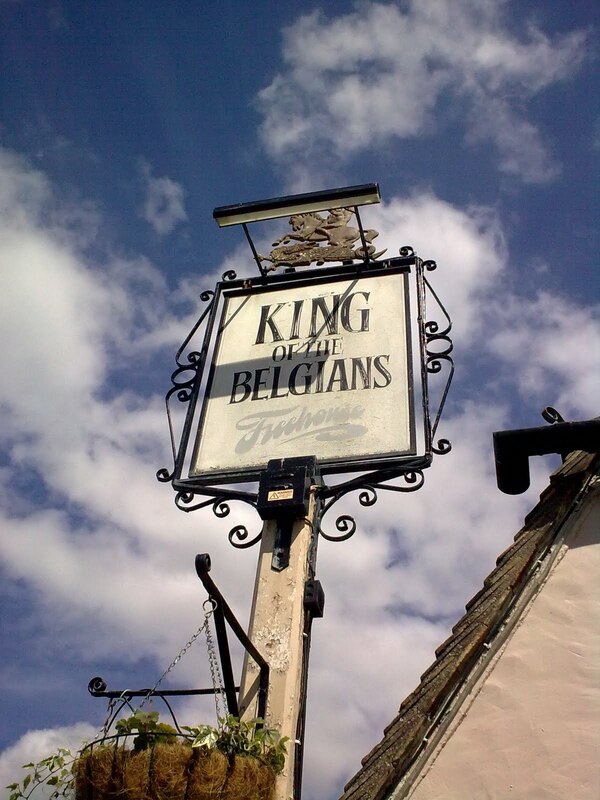 Second break of the day, and this time, I'll be visiting the Retro Sweet Shop for some cinder toffee, and a pint in the King of the Belgians. The second stint I just spent was alongside Claire Dutton, who is a Town Councillor for the Tories, and she is the wife of Jeff Dutton, who is a District Councillor, and hope to be Chairman of the District Council in the near future. It is often hard to tell what people are thinking before they go into the Polling Booths, but there are some who clearly show their intentions. The pictures above tell their own story. Ben's mate Harrison, who plays in goal for the mighty Brampton Spartans, lives with his mum and step dad, Michelle and Trevor, on the main road into town. When we met on the touchline on Tuesday following Spartans fantastic victory over Alconbury (we've now played 19, won 15, drawn three, lost one all season) they told me they had already voted for me as a postal vote, but could they put a board up? Too damn right, and later that day, it was installed. 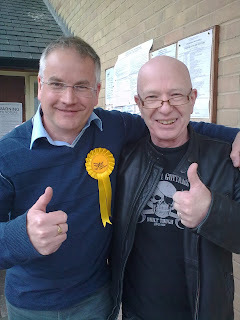 The other picture is me coming out of the polling station at 11.45 a.m. with Barry Mitchell. Barry was the original bass guitarist with Queen, and still plays a mean bass. However, his latest venture is the Retro Sweet Shop in Huntingdon, and I am off there shortly to get some lucky LibDem cinder toffee. The adrenalin is rushing through me, and it's proving to be a battle royale. The inexperienced first timer versus the likeable Tory Mayor of Huntingdon. 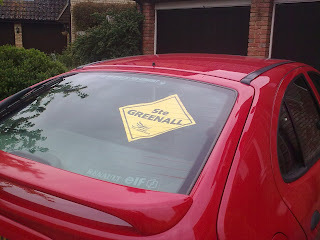 Let's hear it for the boy.......GREEEEENAAAWL, GREEEEENAAAWL, GREEEEENAAAWL! 6.15 a.m. Early start, shower, shave, quick drink, and off to do some "telling" for two hours at the Polling Station. Out of the house at around 6.45 a.m., and the man who will be sitting opposite me for the next two hours is Saeed Akthar, who is the Tory candidate, and clearly, we are in a two-horse race. It's me or him, by the time the counting is done tomorrow. He's a really nice bloke, and we wished each other well. The first two hours flew by, and I was relieved when David Priestman, the man who is standing down from the seat, came to take over at 9.00. So I wandered down to the Barley Mow for bacon butties and a brew. Fantastic. Then a quick call home to update the blog and Facebook. Then it'll be back on duty for two more hours. 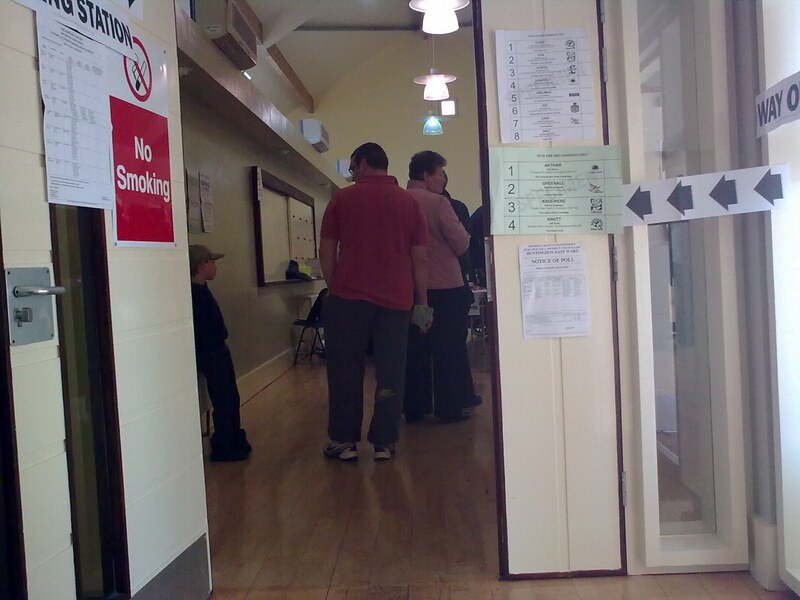 It's strange to see people whose doors I have been knocking on over the last four weeks, turn up to vote. They are using the main hall this year, and it has been a busy start, I have had many good wishes, but then, so has "Sid". Blimey, it's 9.45 already. Doesn't time fly when you have an election to win. I don't know how Brown, Clegg and Cameron do it! I am knackered. 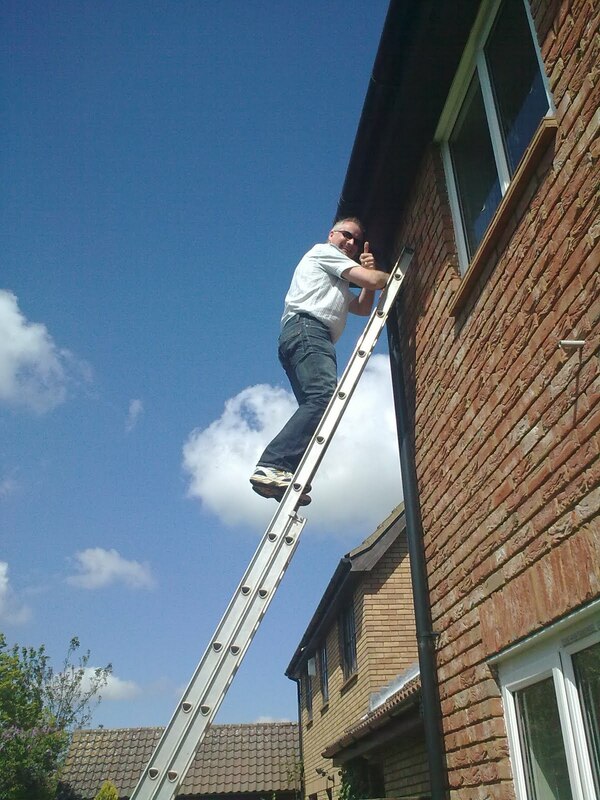 Mind you, I have had to do a 9-5 daily at Pro-Spray, working the numbers for my employers, but I am almost done now, for two days, and I am looking forward to a decent night's sleep, and a hard day round Huntingdon East. I am aiming to take plenty of pictures throughout the day, and, if they will allow me, at the count as well, on Friday, so I can produce a full diary of the two days events. Thanks to anyone who has sent nice messages, they are appreciated. I really need a good night's sleep tonight, so I shall turn in early. I shall leave with the words of my favourite song of the last few years. What made me behave that way? So throw those curtains wide! One day like this a year'd see me right! I have to admit that when it came to knocking on doors for the first time, there was more than a hint of nervousness in me - something I didn't expect. 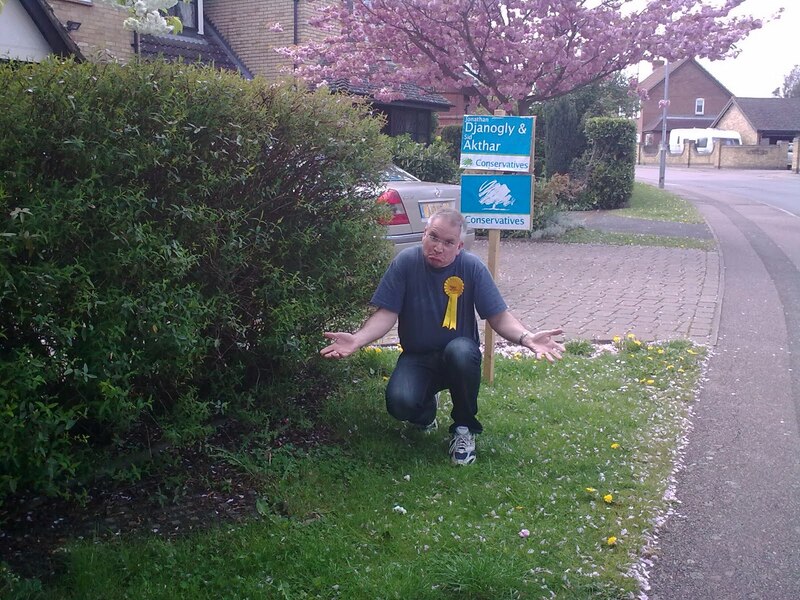 Of course when you have knocked on a few doors, and had some responses, it starts to get easier. 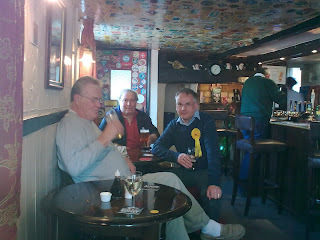 It was made easier still for me by going out initially with Mike Shellens, and then more recently with my neighbour, a life long Liberal, Peter Clark. I think Peter and I came to think of ourselves as Vince and Nick! 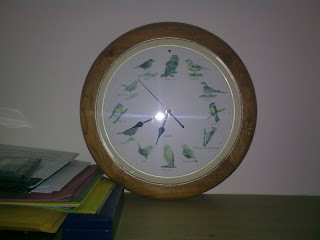 And what is more, having two people together worked wonders for us in "my home patch" - the Birds Estate. Over 1,000 voters, over 600 houses, and many hours of walking, knocking, delivering. On a few occasions, we encountered Saeed Akthar, the Conservative candidate, who was usually with Mike Simpson (who is already a Conservative District Councillor for Huntingdon East) and Jeff Dutton, who lives near me but serves Huntingdon North. 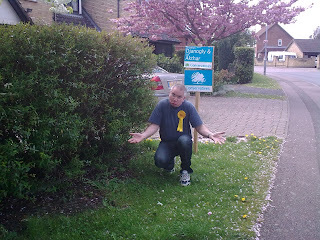 I am bound to say this, aren't I, but I felt we had more spring in our step as we campaigned, and going from the feedback this time, compared with the last District Council elections two years ago, I felt a real sense of things moving our way. Of course, I could end up with egg on my face for saying that, but with only a couple of exceptions, the Lib Dem vote is holding well, or has strengthened. 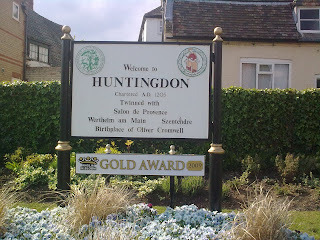 Going purely from the reactions Peter and I have been getting, we feel we are taking votes from the Conservatives in our patch of Huntingdon East. 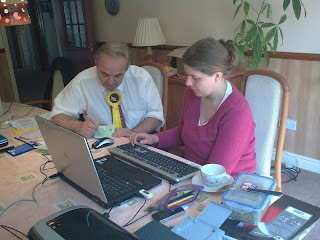 The main thrust of the campaigning is now done, but there is a lot still to do, and last minute 'focused' work to do. As for the day itself, now less than 48 hours away, I am being "told" by the campaign team where they want me, and what they want me to do, and despite initial protestations, I shall take their guidance - they haven't been wrong yet. What that will permit me to do is take a few breaks during the day, and update this blog as the day goes by. One last appeal - if you are a first time reader, having had a leaflet yesterday with the blog address on, please send me an e-mail on ste.greenall@ntlworld.co.uk if you would like a board or diamond. 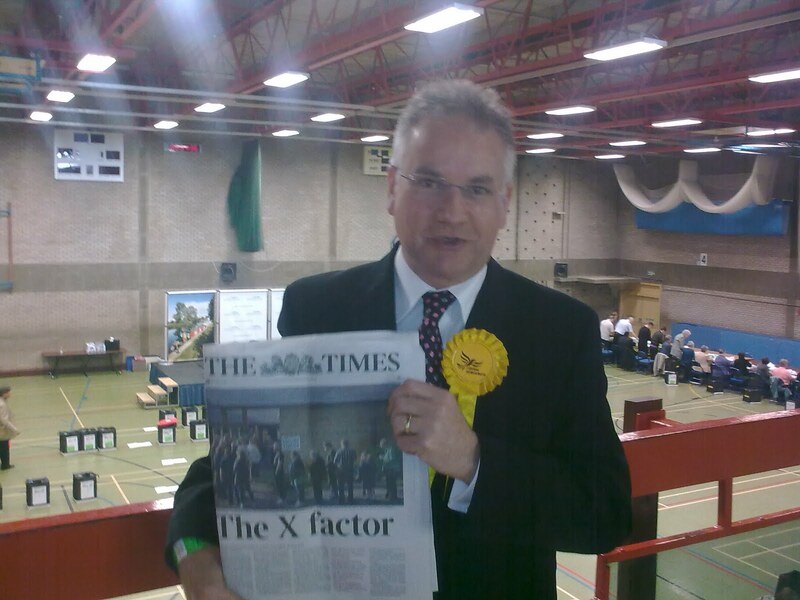 And remember - a vote for me ensures a Lib Dem voice in Pathfinder House. 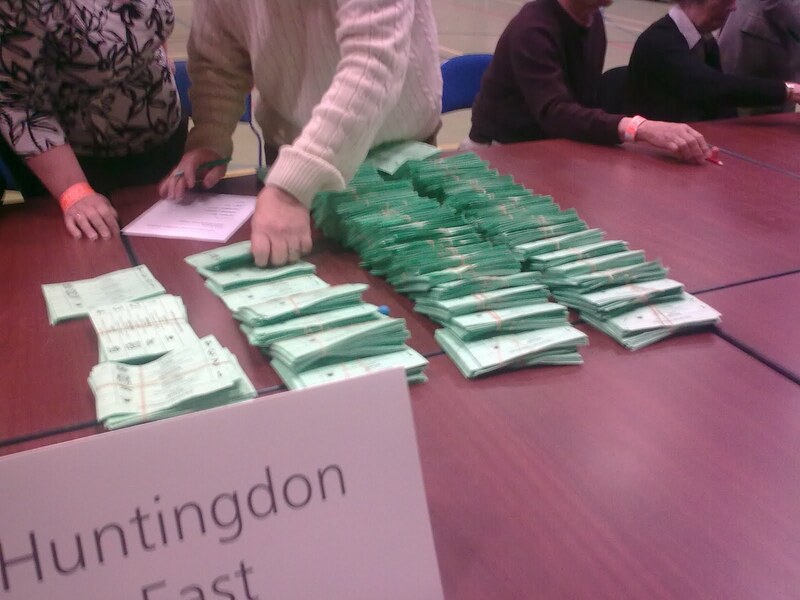 A vote for Martin Land keeps the sitting MP, Jonathan Djanogly, out. In Huntingdon, it really is as simple as that. 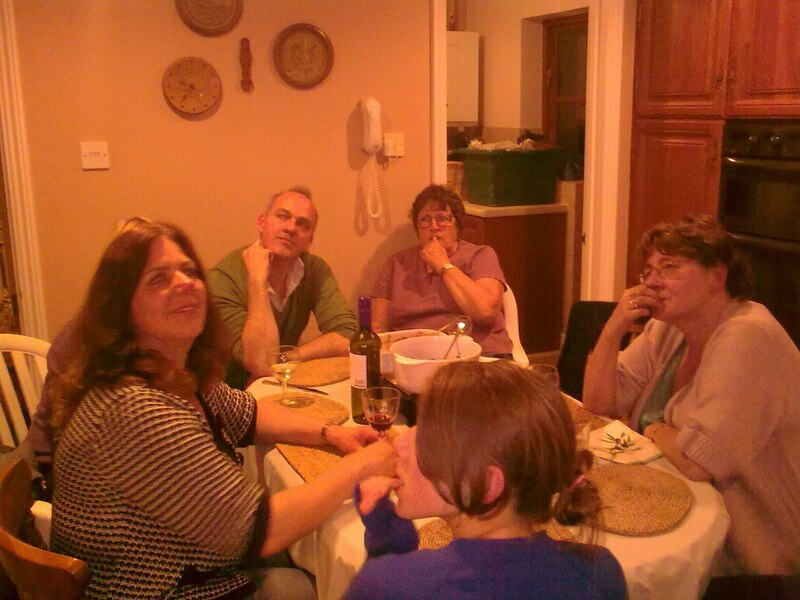 At the time of this campaign starting, I had only used this blog for family nonsense and a bit of fun. In the last three weeks it has become a tool of my campaign. And whilst it is only a few, I have 6 followers. That may increase when the weekend leaflets go out. It is getting to what they call the "business end" of the campaign, and the battle for votes gets more intense. Well, in some areas. Those people who have had postal votes have voted already, in many cases, so if they have not been telling me porkies on the doorsteps, I have quite a few in the bag already, which is nice. Out canvassing with Peter Clark yesterday, we picked up on several things which have been common to this campaign. We have met traditional Tory votes who, in many cases because they have lost faith in their MP, are switching sides, and because they don't like Gordon Brown and his Labour Government, are going to vote Liberal Democrat. Actually, I know of one who is going to vote for me but can't bring herself to go "all the way" and vote for Martin Land, so instead, to make her feel she hasn't helped either side in the General Election, she is backing Lord Toby Jug. A number of people are going to vote for me simply because they like me, so I am going to have to work especially hard to prove them right , if I am elected. I respect those who have voted for someone other than me. I just hope that if I am elected, I'll be judged on who I am, and not where I live or what others have not done in the past. Today, when you hold down a very busy full time job, and have been working in the evenings and at weekend on the campaign, it is very tempting to think....awwwww look at that rain, I think I will give today a miss. Well, I am going to show that you can work in the rain, and with over 1,000 leaflets to deliver, I shall be out there. And anyone reading this who lives near me, on the Birds Estate, who hasn't met me on the doorstep, but has had a leaflet giving my blog address, if you want me to call round, send me an e-mail to ste.greenall@ntlworld.com and I'll make a convenient time to pop over. Can't say fairer than that. Before I sign off this posting, I'd like to draw attention to the leaflets you will be receiving today. I WILL URGE THAT ALLOWANCES ARE CUT BY 10% IMMEDIATELY, AND EXPENSES REVIEWED. This is something I think David Cameron is now proposing for MPs. Will local Tories support the idea at District level? You can be sure I will be asking. Meanwhile, can I say publicly, thanks to everyone who has a board up at their house, or a diamond at their window? There are not very many round here, but the picture at the top of the shows me next to one.